Eat your way across Italy without leaving the city at New York’s top Italian restaurants. From Tuscan home cooking to fine dining, Roman style, these local eateries are cooking up some of the best Italian this side of the Atlantic. For when a dollar slice just won’t cut it, here are the best Italian restaurants in Manhattan, New York. Serving everything from breakfast to post-dinner dessert, Maialino is a “trattoria reimagined for present-day New York City.” Swap your view of the Pantheon for Gramercy Park vistas at this Flatiron favorite, where diners dig into fettuccini with pork ragu, herbed seafood stew, brown sugar bourbon gelato, and more. With accolades from The New York Times, AAA, Relais & Chateaux, and more, Del Posto backs up its claim to be the “ultimate expression of what an Italian restaurant should be.” Even bolder than this assertion is the restaurant’s cuisine, which includes milk-braised heritage pork, Roman-style sheep’s milk ricotta, and pasta with rabbit sausage, all available on Del Posto’s various tasting menus. A luxurious European atmosphere and backing by the likes of Mario Batali and Lidia Bastianich solidifies Del Posto’s status as New York’s Italian ideal. 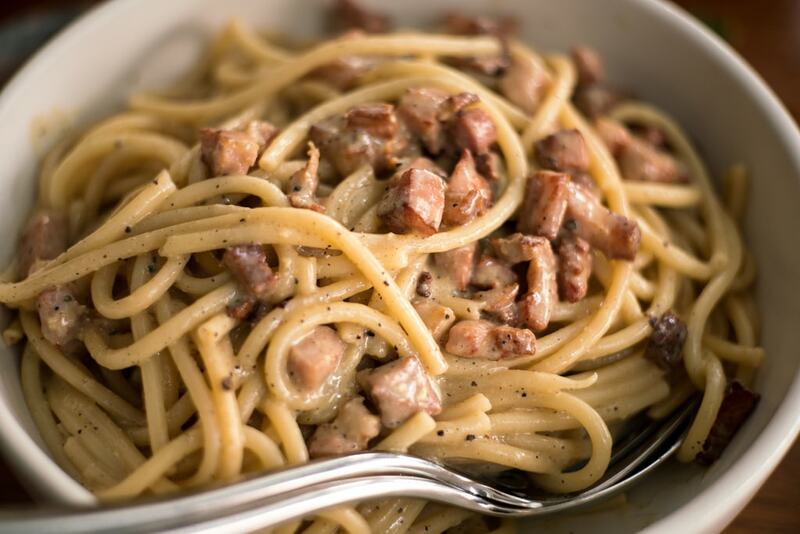 Greenwich Village’s Babbo is the daring diner’s pick for adventurous Italian eats. Lamb chops with sweetbreads and beef tongue, pig foot Milanese, and goose liver ravioli are just a sampling of the spot’s out-of-the-box offerings. 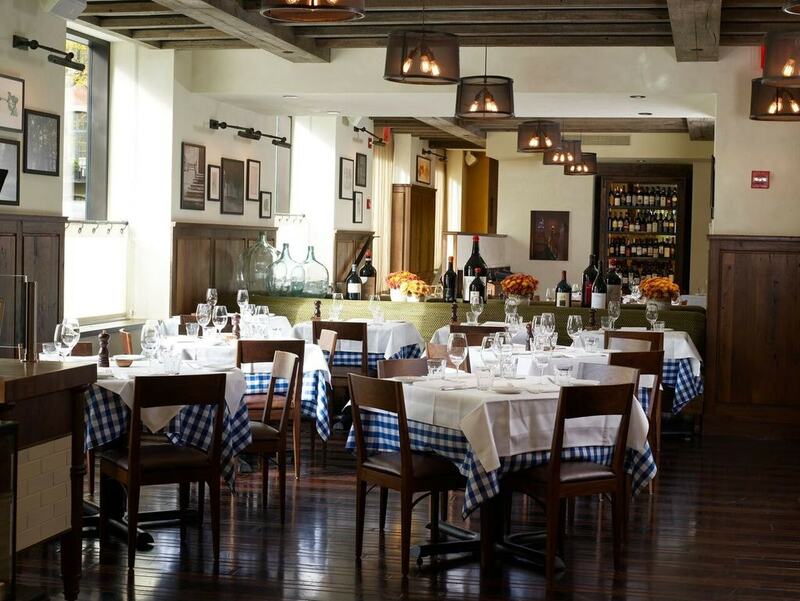 Tip: Choose Babbo for your next group outing, and take advantage of the restaurant’s unparalleled tasting menus. Not your parents’ fine-dining destination, Carbone elevates the Italian-American eating experience for a new age of eaters. Created by Mario Carbone, Rich Torrisi, and Jeff Zalaznick as an homage to New York’s mid-20th-century Italian-American restaurants, this foodie favorite serves upscale eats without attitude. Lobster Fra Diavolo, cherry pepper ribs, and veal marsala round out Carbone’s menu of old-meets-new noshes. What do you get when you combine fine ingredients, Italian cuisine, and a carefree Californian attitude? If you’re Chef Justin Smillie, you wind up with Upland, a culture-combining gem of the global dining scene. Here, smoked salmon pizza, local tuna carpaccio, roasted porchetta and egg sandwiches, and more accessible eats are washed down with your pick from Upland’s 500-bottle list. "Itching for a West Coast vacation—even if just for the afternoon? Upland serves Cali-inspired dishes so you can get a taste of the left coast without even leaving NYC. Bask in the laid-back ambiance and order items like a five-lettuce Caesar salad, asparagus pizza, or spaghettini pomodoro. "- @gothammag's "The Most Decadent Ways to Take a Lunch Break This Summer"
Treat your mouth to a Mediterranean tour at the homey Il Buco. Inspired by Italy, Spain, and “great food amongst friends,” this down-to-earth eatery serves European elegance at its finest. Here, ricotta fritters, grilled hanger steak, and olive oil flights taste just like Nonna used to make and are prepared with just as much love. At Greenwich Village gastroteca Via Carota, the Old World Italian lifestyle combines with of-the-moment seasonal ingredients to create a timeless, tasty cuisine. From the warm service to its menu of comforting dishes, everything about Via Carota gives the impression of dining in someone’s home—that is, if your host could prepare restaurant-quality fried rabbit with fresh herbs, gorgonzola gnocchi, and chilled seafood salad. Authentic Tuscan cuisine secures a stateside address at I Sodi. Here, a menu paying homage to the “classic simplicity” of home cooking features house-made lasagna with meat sauce, hand-chopped steak tartare, whole grilled Branzino, and other ingredient-focused foods designed to be both savored and shared. With its fresh-from-the-sea selection, Marea, Italian for “tide,” sets out to refine “the seascape of high-end Italian cuisine.” Over 750 wine selections, half of which are European whites designed to complement fresh seafood, are on hand to pair perfectly with dishes such as salt-baked Branzino for two, squid ink pasta with pork sausage, and raw fish slices. Our bone marrow fusilli with red wine braised octopus. Tag a friend you would share this with. For fine Italian fare without the customary side of pretension, Barbuto is the down-to-earth diner’s best bet. Headed by James Beard recipient Jonathan Waxman, this West Village destination serves up brunch, lunch, dinner, and all-day neighborhood vibes. Swordfish with butter beans, pork chops with apple mostarda, and formaggio platters round out Barbuto’s menu of approachable eats. Italian fare with a New York flair is what’s on the menu at Café Altro Paradiso. Brought to you by the same team behind foodie-favorite Estela, this SoHo hot spot reimagines Italian cuisine for New York noshers to great effect. Paradiso patrons can expect to enjoy Wagyu burgers with gorgonzola and patate fritte, oysters with balsamic mignonette, and a drinks selection that ventures beyond standard reds and whites to include perfectly paired cocktails, beers, and liquors. At Porsena, there is always room at the table. A trattoria modeled after the “simple restaurants in Italy that serve as neighborhood dining rooms,” this East Village establishment specializes in timeless Italian dishes and hospitality. Cheesy wild mushroom risotto, skirt steak with herbed smashed potatoes, and pasta with spicy lamb sausage and mustard greens are finger-licking fuel for a delicious dining experience. Food fans have world-renowned chef Mario Batali to thank for this Italian lover’s mecca. Home to multiple restaurants, including La Pizza & La Pasta, the fresh seafood-focused Il Pesce, and the rice-centric pop-up Riso e Risotto, Eataly is an ideal destination no matter what you’re craving. 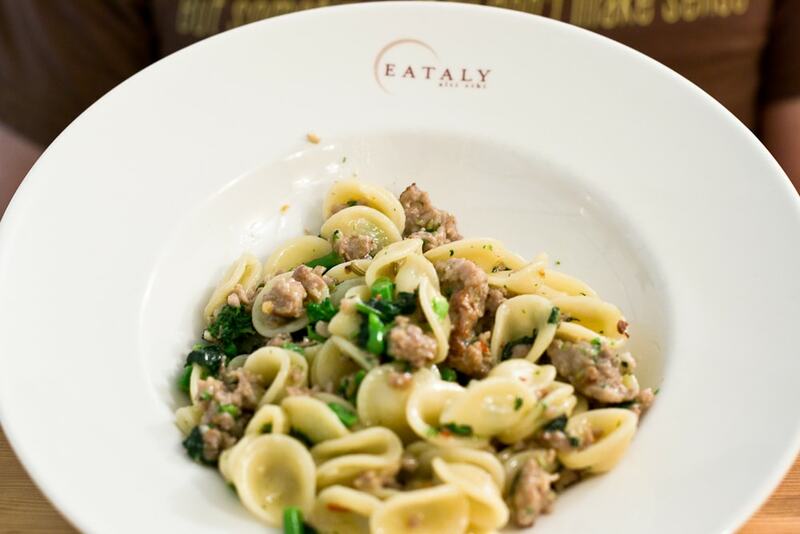 Doubling as an emporium of Italian goods, Eataly also allows you to reproduce your favorite plates at home.